Make business cards and promotional fliers. Distribute these items around local art galleries and fairs. Tell friends, family, and co-workers about your art. Those that are closest to you are your biggest advocates. 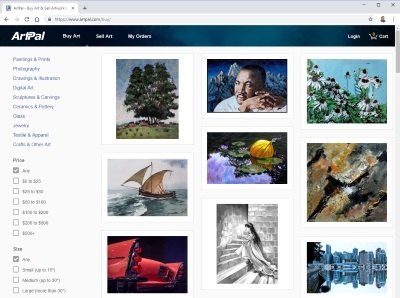 Let your friends, family and co-workers know that you are selling your art. Display your art at a local fair. Most communities host a variety of art fairs throughout the year. Research the various options and decide which one, or ones, would be most appropriate for the type of art you are selling. Take your art to interested patrons. If you know some people who may be intrigued by your work, host a small get together at your house or at one of their houses. Hold a local exhibit at an art gallery to display your work. Art galleries host events to show off new artists' artwork that can help you get your name into the art world.